In January 2002 we (along with Ann's parents Eva & Harry) took a two-week cruise on Royal Caribbean's Legend of the Seas. 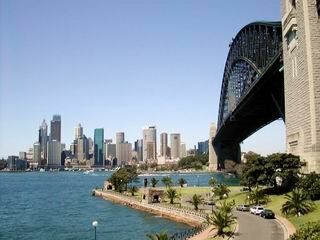 The cruise started in Sydney (fortunately we found some good flights to Australia) and sailed south down the coast of Australia, with stops in Melbourne and Hobart, Tasmania. After crossing the Tasman Sea to New Zealand, the ship sailed through the Fjordland National Park, and then up the east coast, with stops in Dunedin, Christchurch, Tauranga and finally Auckland. The weather was perfect everywhere we went. Sydney had been having terrible forest fires for weeks, but just days before we arrived a powerful rainstorm extinguished the fires, washed the skies clean, and then departed, leaving perfect sunny weather. At several ports-of-call, the locals told us they thought summer was never going to come, and thanked us for bringing the glorious weather with us! We started our sightseeing even before we got to the ship. 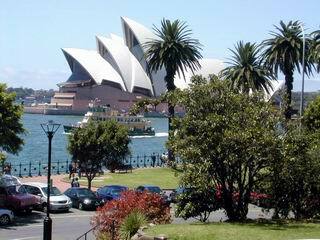 The bus from the airport stopped at a lovely park across the harbor from downtown, with a view of the famous Opera House. On our right was the imposing Harbour Bridge (largest single-span bridge in the world), which we would soon be crossing. 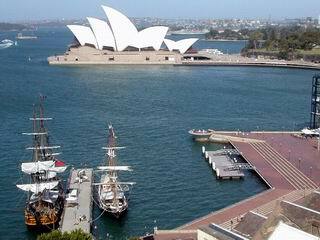 While crossing the Harbour Bridge, we had this side view of the Opera House, as well as the HMS Bounty sailing ship in the foreground. 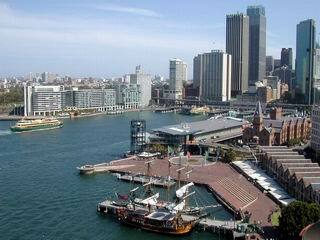 We could also see the Circular Quay area, with the Ferry Landing at the back, and The Rocks on the right. We stopped in The Rocks for a quick thirst-quencher, with a great view of the Opera House and the constant ferry traffic. 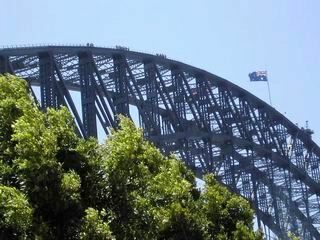 Looking up at the Harbour Bridge, we could see the brave souls doing the "Bridge Climb." 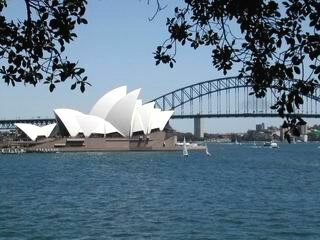 Then it was all the way around to the park at Macquarie Point, for a view of the other side of the Opera House. 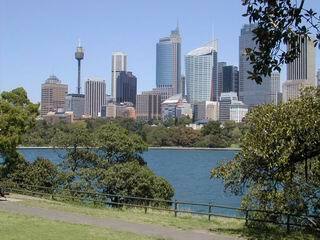 The park also offered a nice view of the downtown skyline, including the 1065' tall Sydney Tower (tallest structure in the southern hemisphere). When traveling in a foreign country, it is advisable to plan-ahead for any medical needs. For more information, visit Travel Doctor Brisbane.